Location: Canyon Lake, TX Off of FM 306 and Hancock Rd. Facilities: A picnic table shaded by an awning in the center of the trail parking area. There are no other facilities; no running water and restrooms. No shade trees in the trailer parking area. 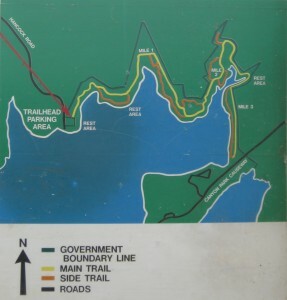 There is access to the lake from the trailer parking / trail head area and throughout the trails. Terrain: Some rocky areas, mostly flat, and fairly open with some trees (bring your sun block). Update for July 2014: There is now a FaceBook group for this area at Friends of Hancock Equestrian Trail. 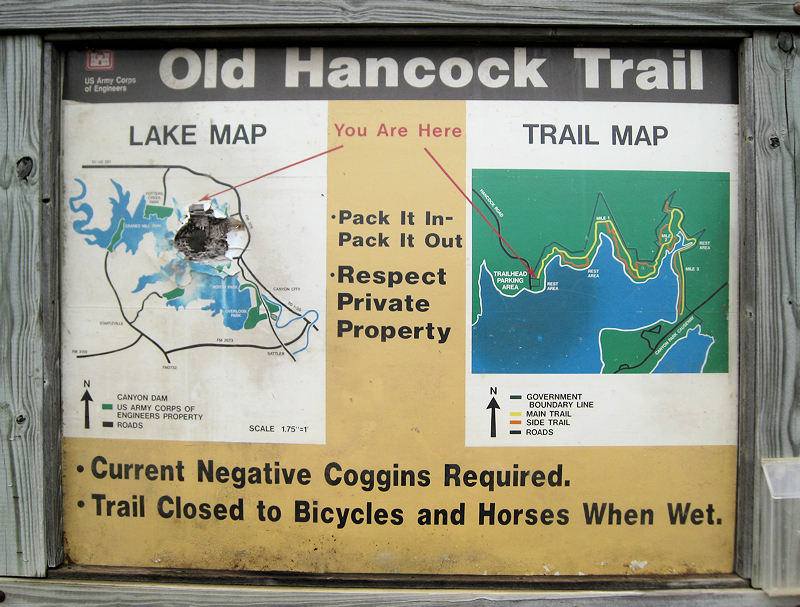 Old Hancock Trail is managed by the US Army Corps of Engineers. Trail maitenance is up to trail user volunteers. 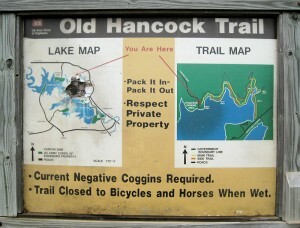 This trail was recently closed due to lots of rain and high lake levels. Thanks to trail user volunteers and their hard work it has been reopened! 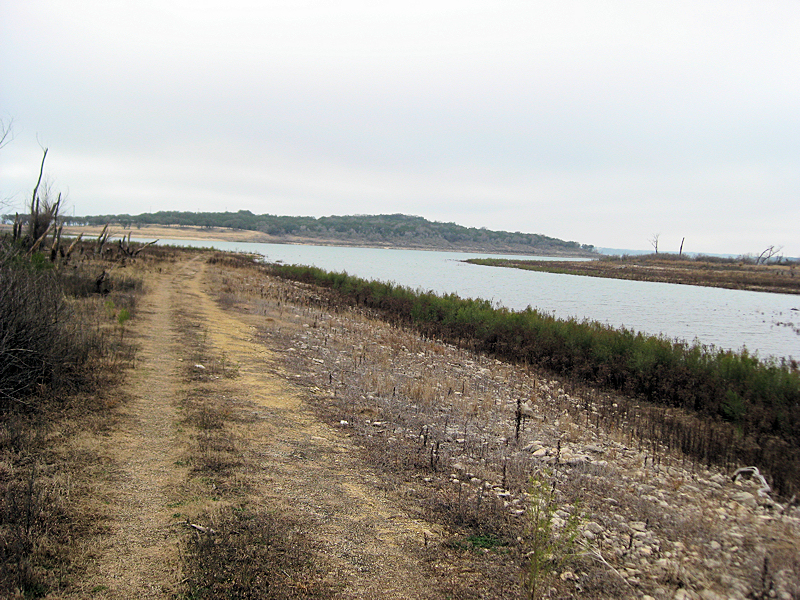 The trail is located off the Northern Shoreline of Canyon Lake. 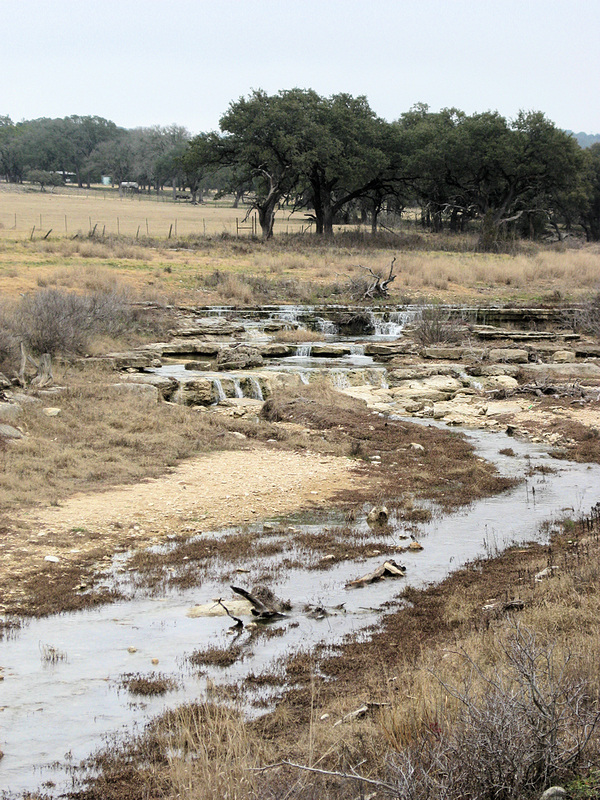 Once you turn on Hancock Road from FM 306 the trail head is about 1.5 miles. Driving down Hancock Road there is a small airport on your right and then a cedar fence line on your right. The road dead ends into the trail head. The trail head is spacious with plenty of room to maneuver a large rig. The surface of the trail head is mainly sand and caliche. A picnic area is located at the center of the trail head. There are no mounting blocks, pens, or hitching posts. This park has no running water or electricity. The trail begins at the northern end of the trail head where the map is posted. The trail ends at Canyon Park road which is about 3.5 miles and then curves back around, making the round trip approximately 7 miles. You will hit a few rocky spots on the trail. The trails are mainly flat and do not offer much in the way of inclines or steep ravines. There are a few dips and two creek crossings. 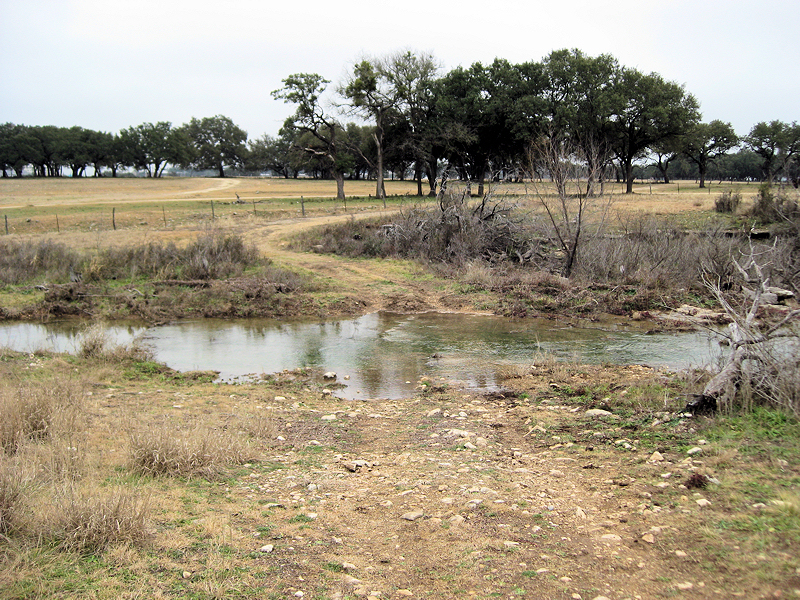 Often times, especially during a drought the creek crossings are dry. The trail also has a few loops, but is mainly straight forward and easy to follow. 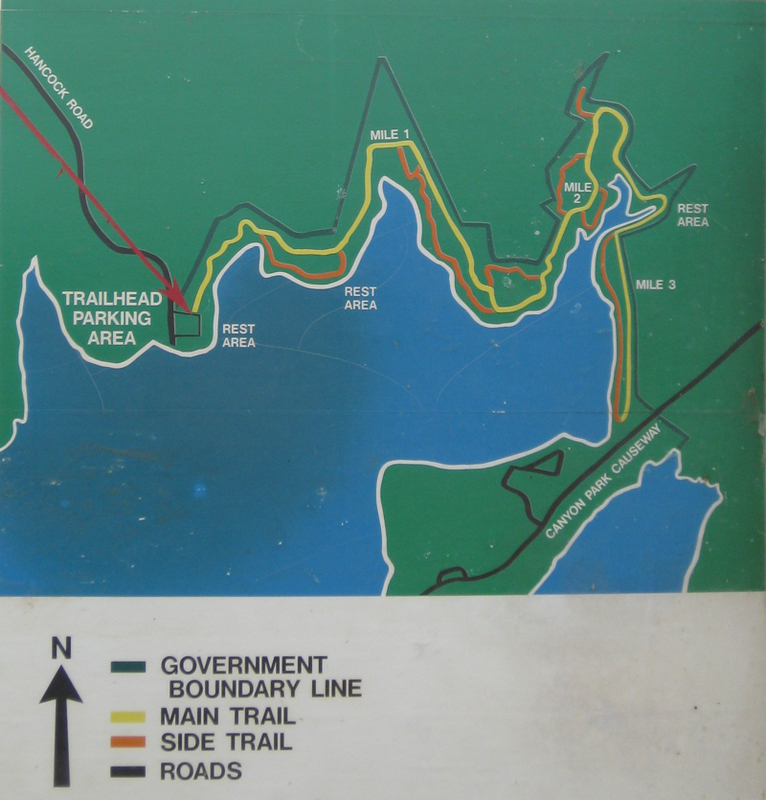 A few brown metal trail markers with arrows pointing in the correct direction are posted. There are signs warning not to cross over into private property which is mostly fenced or cabled off. Several rest stops with benches, great for riders who prefer to mount up using a bench/mounting block, are located beside the trail. There is not a great deal of cover so sunblock is needed and it can get windy. If you are looking to slowly condition your horse to beach riding this trail would be a small step in that direction. There are a few short trail spurs leading up to the lake and on most days small waves gently role onto the shore. 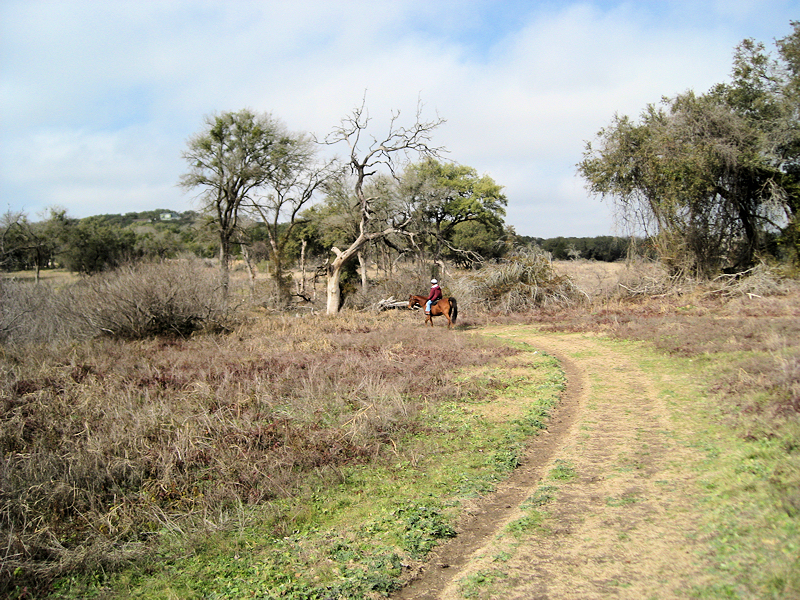 These trails are good for conditioning your horse to large open spaces. There will be hikers and bicyclists sharing the trails. Sights and sounds of boats, ski jets, and other water recreation activities will be occurring. You will have plenty of opportunities to expose and desensitize your horse to new situations. The views provided by Old Hancock Trail are lovely, especially during the wildflower season. Distant hills in the horizon and the beauty of the lake can be soaked in and admired. Deer and several species of birds are often sited at the park. Trees having met their end maybe from drought or flood present formidable monuments of nature. Layers of rock create mini water falls in the creek after a good rain. On a hot Texas day strip off the saddle and your boots to cool off in the Lake with your horse, a great way to end your ride.